Wandering the streets of London for the past week or two you may have noticed some rather beautiful visitors to the city. 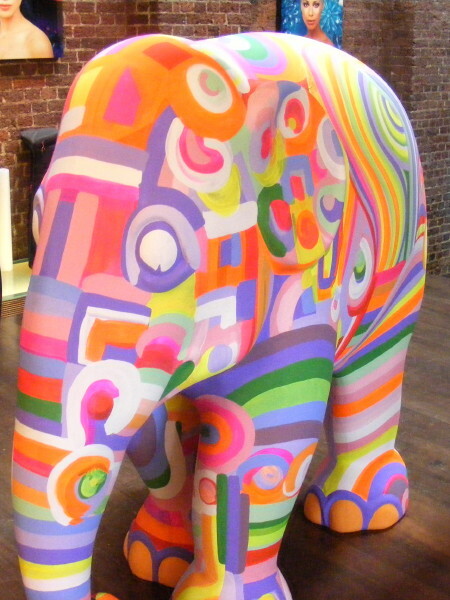 250 exotic painted elephant sculptures are parading the streets around London as part of a campaign by elephantfamily.org to help raise awareness and money for the Asian elephant as well as UK conservation companies such as Born Free. The Elephants have been painted by greats such as Jack Vettriano, Mark Quinn and Matthew Williamson. Queen of the wrap dress Diane von Furstenberg created elephant ‘Twiggy’ painting her white with red geometric shapes. From elephants in disguise as tigers, to one being covered in black and white pin up photos, another being painted with anti-graffiti resin and Lulu Guiness’ elephant covered in lipstick kisses, they are all unique and convey a powerful image. They are for sale through auction in July. However if you fancy taking one home miniatures are available from Selfridges, Carnaby Street and Regent Street. Elephants from parades all over the world can also be bought on the website shop.elephantparade.com. Visit the website Elephantparade.com where you can find out about upcoming events including the auction, as well as sign the petition to help save the elephants. The elephants can be seen strutting around London until July 2010, when they will head off to New York. Also keep your eye out for the lovely Zara Martin's contribution with BodyAMR and read a little more about the cause in upcoming issue of Cellardoor. I saw these in a magazine and fell in love. I wish I could get to London to see them for real! That's so lovely! I want to see them for real, especially that Lulu Guinness one! Too cute. awwi love these very very much!